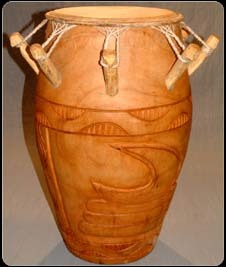 The Kpanlogo drum as with other African drums were used as a form of communication as they could be heard clearly over large distances. 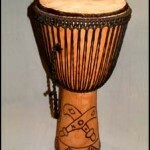 African drums such as the Kpanlogo drum were also used to communicate the commencement or the end of war. In the case of the Kpanlogo drum, it was use in the royal courts of Ghana and would have been used in ceremonies and celebrations as well as communications such as announcement to the people the birth or death of members of the royal family. The Kpanlogo drum played such a central theme in many of the important ceremonies that it became known as the ceremonial drum. Today it still plays an important role and can be found in many African bands. Our Kpanlogo drums are handmade and are treated with palm oil, which not only protects the wood on the drum but also gives it a rich patina. 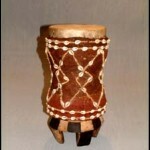 Numerous small wooden pegs attach the drum skinhead, which have been adjusted to give a rich sound, which the Kpanlogo drum is well known for. This is a wonderful piece of functional African art. Strong health is a result of regular exercise and lifestyle. How can remedies hels up? For example Diprolene cream is a topical corticosteroid. This medicine reduce swelling associated with varied skin conditions. Kamagra is an ideal preparation for helping men to sustain an erection. What about cialis 5mg cost per pill and how much does cialis cost? Our article tell more about the evaluation of erectile disfunction and cialis price. Other point we have to is undefined. Perhaps you already know about it. Why it happen? What kinds of professionals treat sexual heartiness problems in men? What can patients ask a doctor before taking Kamagra? So, ordering generics from Internet can save period, but keep above mentioned safety tips in mind.